12 days of Christmas at Starbucks! - DAY 2 ~ Smithankyou - Lifestyle and Travel Photo Blog. 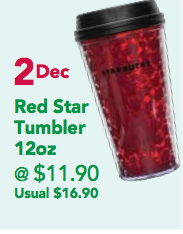 Discounted Tumbler! Do you think there will still be a long Q like yesterday's? Mr.Smith, I like to act atas but I am still a Singaporean after all. GPGS FTW!